Welcome to the Holiday Inn Select & Convention Center Tinley Park.Minutes from downtown Chicago with easy access to I-294, I-57, I-80 and I-355. Major airports: O&reg Hare International (ORD-40 minutes) and Midway Airport (MDW-20 minutes). Experience the finest in hotel and convention services. Maintain your exercise regimen in our fitness center. Swim year round in our indoor pool or relax in our hot tub. Catch up on work in our business center. Bananas Grille & Bar is open daily for breakfast, lunch and dinner with menu selections such as slow-roasted Prime Rib and fresh seafood entrees. Unwind with our nightly drink specials or try our in room dining. Our 40,000 sq. 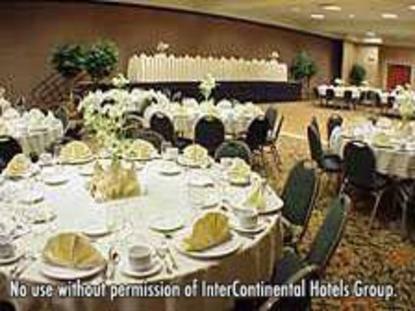 ft. convention center makes the Holiday Inn Select & Convention Center "the perfect place." Our meeting planners will help with every detail of your event, making us the favorite for wedding, conference, banquet, military, reunion and convention planners. Businesses near hotel: Ace, Allied Tube, Applied Systems, Bimba, Federal Signal, Formax, Ford, Francorp, Panduit, Greater Chicago Auto Auction and ITW.Attractions near hotel: First Midwest Bank Amphitheatre, Route 66/Chicago Speedway and Odyssey Fun World. Golf Courses nearby: Cyote Run, Graystone, Green Garden, Odyssey and Silver Lake Everything you expect, and much more. This hotel is committed to providing accessible facilities under the American Disabilities Act. If your accessibility needs are not met, please contact the Hotel Manager on Duty. Should you require additional information regarding accessible facilities for guests with disabilities, please call 1-800-Holiday (U.S. and Canada) or contact the hotel directly. For the hearing impaired, TDD service is available at 1-800-238-5544 within the U.S. and Canada.